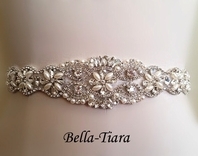 Description: Stunning new Swarovski rhinestone design a dazzling elegant classic look for any bride or a special event . 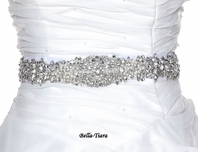 Sparkling ss34 Swarovski rhinestones place, our most popular bridal belt. 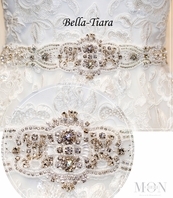 The rhinestone applique is 18"L-- between 3/4 - 1" wide. 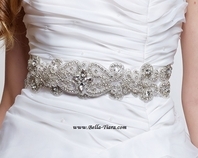 Please contact us for pricing if you need more inches for rhinestone belt. 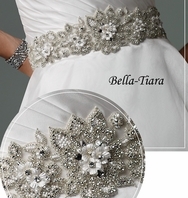 comes with 3 yards long ribbon attach the so you can tie a bow in the back. 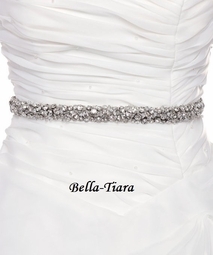 or make it to your specification and attach to your dress. 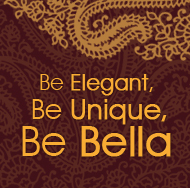 30" of design available or longer if needed contact us.